Ice Age is a feature-length computer-animated film created by Blue Sky Studios and released by 20th Century Fox in 2002. It was directed by Carlos Saldanha and Chris Wedge from a story by Michael J. Wilson. 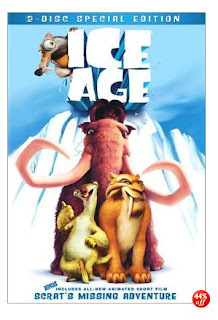 Its sequels are called Ice Age: The Meltdown (2006) and Ice Age: Dawn of the Dinosaurs (2009). The film was originally to be directed by Don Bluth and Gary Goldman, and produced in 2D by Fox Animation Studios, but the rise of CGI animation and the failure of Titan A.E. destroyed Fox's traditional animation division, hence Bluth and Goldman transferred their duties for Chris Wedge and Carlos Saldanha from Fox's CGI division Blue Sky. The film begins with a squirrel known as Scrat, who is trying to find a location to store his prized acorn. Eventually, as he tries to hide it, he causes an avalanche. He barely escapes, but finds himself stepped on by a herd of prehistoric animals. The animals are trying to avoid the ice age by migrating south. Sid, a clumsy ground sloth left behind by his family, is attacked by two Brontops whom he angered. 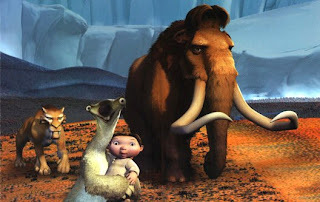 Sid is soon saved by Manfred ("Manny"), an agitated mammoth who fights them off. Not wanting to be alone and unprotected, Sid follows Manny. Meanwhile, Soto, the leader of a Smilodon pride wants revenge on a group of humans by eating the chief's son, Roshan, alive. There is an attack on the human camp, causing Roshan's mother to be separated from the rest. Soto's lieutenant, Diego, is sent to find and bring the baby back. Sid and Manny spot Nadia near the lake having survived her trip over the waterfall. She has only enough strength to trust her baby to Manny before she disappears. After much persuasion by the sloth, they decide to return Roshan (nicknamed "Pinky") but when they get to the human camp, the humans are gone. They meet up with Diego, who convinces the pair to let him help by tracking the humans. The four travel on, with Diego secretly leading them to an ambush. Soon they reach a cave where Sid and Diego learn about Manny's past and his previous interactions with the humans, where his wife and son were killed, leaving Manny a cynical loner. At the end of the film, Diego, Manny and Sid battle Soto's pack and a short fight ensues. Diego fights against Soto, and Soto knocks Diego out. As Soto closes in for the kill on Manny, Diego leaps and stops Soto, who wounds Diego in the process. Manny, in vengeance, knocks Soto into a wall of rocks, where sharp icicles fall on Soto, killing him. Manny and Sid manage to return the baby to his tribe, and Diego rejoins them, as the group begin heading off to warmer climates.20,000 years later, Scrat is shown on a tropical island, with a coconut to replace his lost acorn, but as he proceeds to pack the coconut, it causes a volcanic eruption. Originally, Sid was trying to avoid another sloth named Sylvia. He manages to lose her by putting her in the path of some migrating Glyptodon, who unknowingly carry her off when she got caught on their backs. Later he makes it look like Diego had killed him, but she saw he was faking, so she deserted him in anger. This segment was still used in the movie, but was used for Sid to avoid the two brontotheres who were still after him, as they fell for the trick. It was kept in the storybook version, however. The deleted scenes can be viewed separately, or in Nutty Movie Mode, both of which are included on Disc 1 of the two-disc Special Edition DVD. There is also a subplot where an animal named Scrat makes many comical attempts to bury his beloved acorn. His misfortunes include getting chased by an enormous glacier, being struck by lightning, attempting to thaw out the acorn by a fire too long so that it accidentally took the form of a kernel of popcorn, and finally getting frozen in an ice cube along with his much sought after nut. 20,000 years into the future, the ice cube washes up on the shore of an island. The sun slowly melts the cube, thawing Scrat and the ice surrounding his acorn, which is barely out of reach, and ends up being removed from the ice cube by the tide. 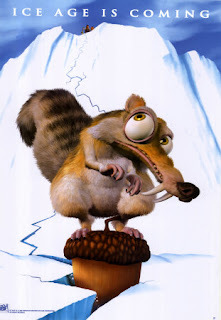 Scrat then explodes out of the ice cube in anger and hits his head repetitively on a tree, which drops a coconut. Believing it to be a giant acorn, Scrat's anger immediately turns to glee at this new find. He tries to pack it into the ground as he did previously with his acorns, but in the process causes a volcanic eruption. Scrat is known to be similar to the Laotian rock rat. Scrat also got his own short film entitled Gone Nutty, where he loses his meticulously-organized collection of acorns in a catastrophic chain of events occurring after ramming his acorn into the hole in the exact middle of the collection. He remains with one which is reduced to an ashen crisp after it went crashing down on him with an impact like a missile, ultimately causing the tectonic shift.